Since we were the first Brazilian students to ever participate in IPT, there has been some mobilization by the press to help us during our crowdfunding campaign that started in January/2017 and finished in April/2017. Below, all the material released about us. To participate in IPT 2018, we also made crowdfunding campaign that will last up to the dates of the tournament. All interviews and news are in Portuguese. 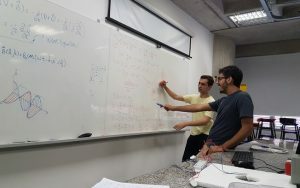 [Estudantes buscam apoio para participarem de torneio mundial de Física]- Students seek support to participate on international Physics tournament- 02/05, Revista Galileu. [Brasileiros conquistam 1º lugar das Américas em competição de Física– Brazilian team conquer 1st place in Americas at Physics Competition- 04/20]- Revista Galileu. [Brasileiros conquistam 1º lugar das Américas em competição de Física– Brazilian team conquer 1st place in Americas at Physics Competition- 04/21]- CBN, A rádio que toca notícias.